It all started with Rylee's first goat Libby. She is the black one with the white patches. In 2010 she had multi-colored Cupcake. She is the tan, white, & black doeling. In 2011 Libby had triplets: Sweetie, who looks just like her, Cookies, & Oreo. 2012 Cupcake had her first set of twins Carmel & Butterscotch. 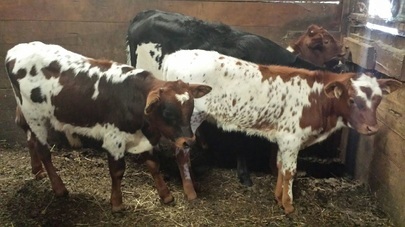 Both gold colored doelings were polled & blue eyed.What a treat! 2013 Cupcake had her 2nd set of twins Reese's & Reese. She gave us beautiful loud colored kids with blue eyes. 2014 once again cupcake had a wonderful set of twins. This time white kids with black spots. They are all so cute! Sweetie had triplets her first year2013, then twins in 2014. Cookies and Oreo were sold. Cupcakes first kids, Carmel & Butterscotch each had a single buckling kid in 2014. These goats have been super fun for Rylee to grow up with. We've sold a few goats along the way, but mostly collected them. They were all so cute and Rylee just couldn't part with them, so our herd grew to 13. This year we decided it was time to let some other families enjoy our cute babies, so we actually sold some goats. 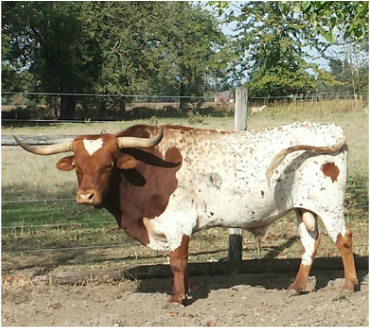 With having sold off most of her goat herd (not Cupcake or Carmel), Rylee is now going to try her hand at raising some longhorn calves! We are looking forward to this new venture. This is Daddy or our new babies!